Amidst all of Homecoming Week’s non-stop events, one doesn’t have time to think about the festivities of the past and their influence on the present. 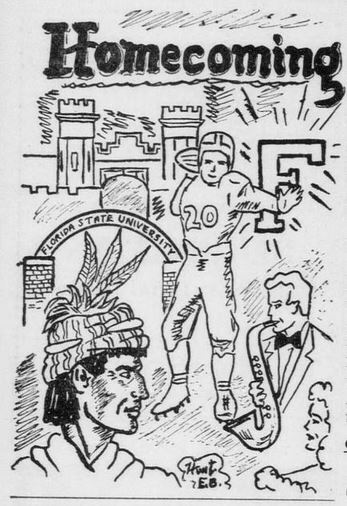 FSU’s first Homecoming, celebrated over the weekend of December 3-4, 1948, boasted concerts, dances and dinners held by various organizations, skit night, Pow Wow, and a football game for students and alumni alike to enjoy. 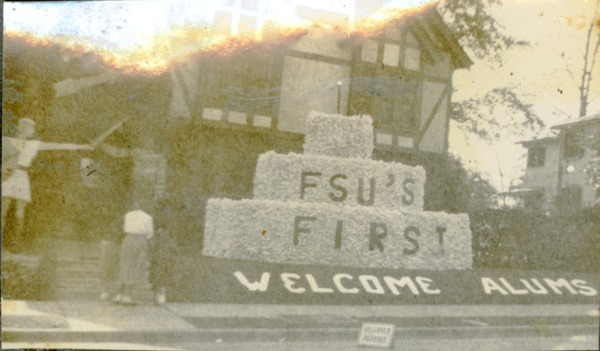 Many of FSU’s greatest traditions started at the 1948 Homecoming. Saturday was packed full of activities for students and alumni to attend. Starting with breakfast and followed by campus tours, visitors were able to view the newest buildings on campus (including the new music building, the first building on campus to have air conditioning), as well as see the entries in the House Decorating Competition. In the afternoon, students held a parade from campus to centennial Field, just in time to catch the game against the University of Tampa Spartans. 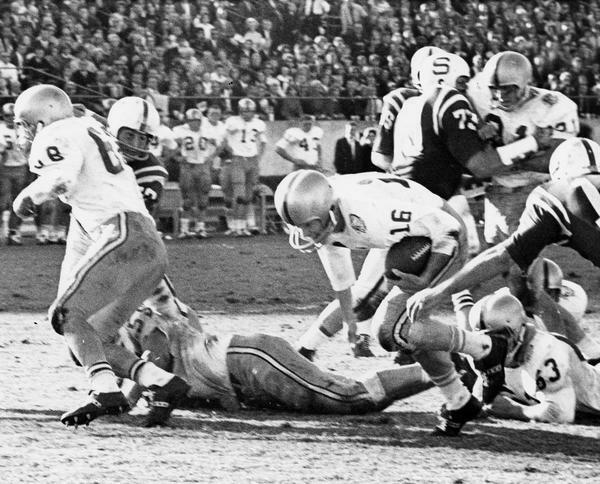 The first Homecoming game set the precedent of the Seminoles winning bowl games. 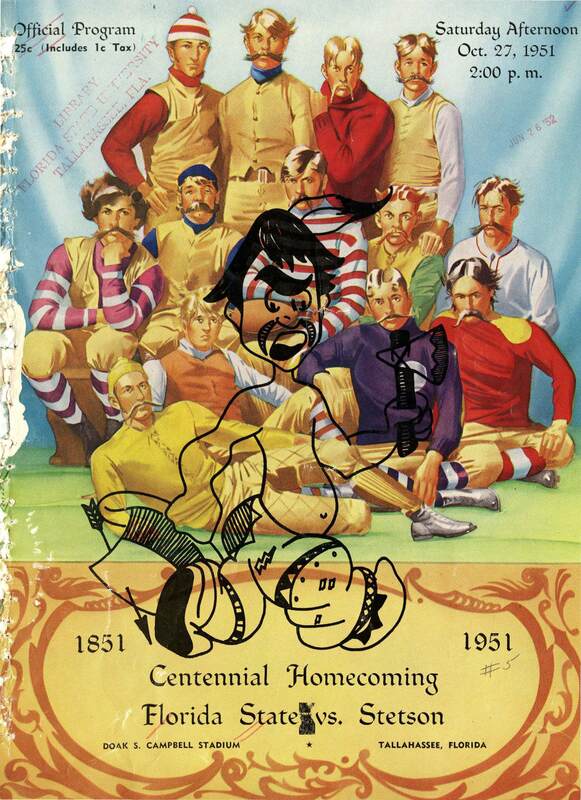 Homecoming coincided with the first bow game of the newly reorganized Dixie conference. The Seminoles finished their second season by trouncing the University of Tampa Spartans with a 33-12 victory. 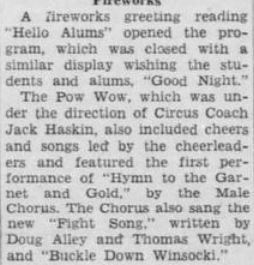 After the game, students reconvened on campus for a dance that featured Hal McIntyre and his 15-piece Metro-Goldwyn-Mayer Orchestra. Formerly a saxophonist for Benny Goodman and later the Glenn Miller Orchestra, Hal McIntyre toured over seas and around America during the mid-century. FSU students and alumni were excited welcome him and his band to campus. At the dance, students chose their new Homecoming Queen. Whittled down from an original 32 Homecoming hopefuls, 5 finalists were rated on an applause-meter, and junior Clara Moffat Howell was chosen to reign supreme. 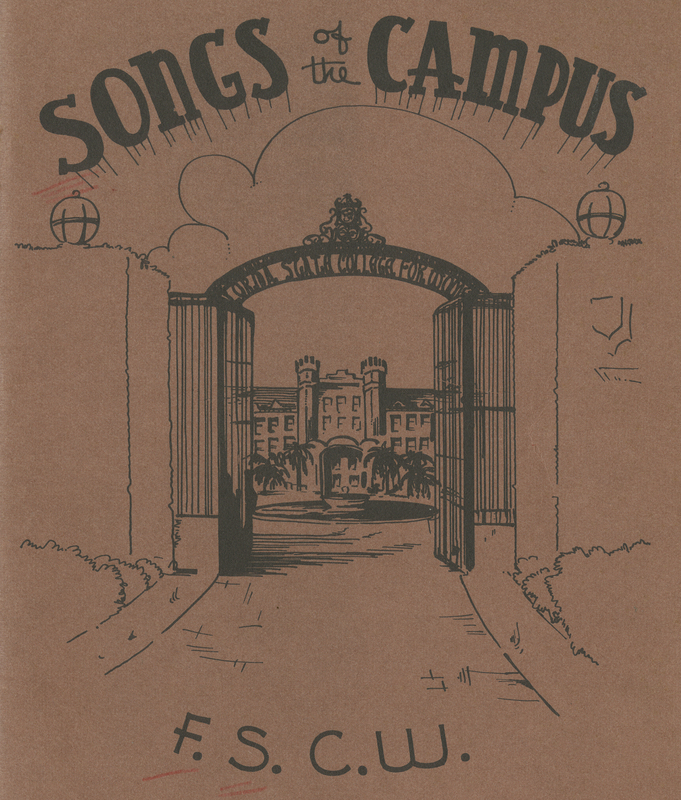 Continuing with tradition, the University Recreation Association continued to distribute song books after the transition to FSU. If you’ve ever attended orientation at Florida State, most likely you learned the words to the fight song (or at least how to spell F-L-O-R-I-D-A S-T-A-T-E), and probably heard the Alma Mater and “The Hymn to the Garnet and the Gold” two, maybe three or four times each. You can also hear these songs at football games, graduation ceremonies, concerts, and as the tinny and garbled hold-music while waiting to get through to financial aid. These pervasive melodies and chants are just a few among a long tradition of campus songs at Florida State. 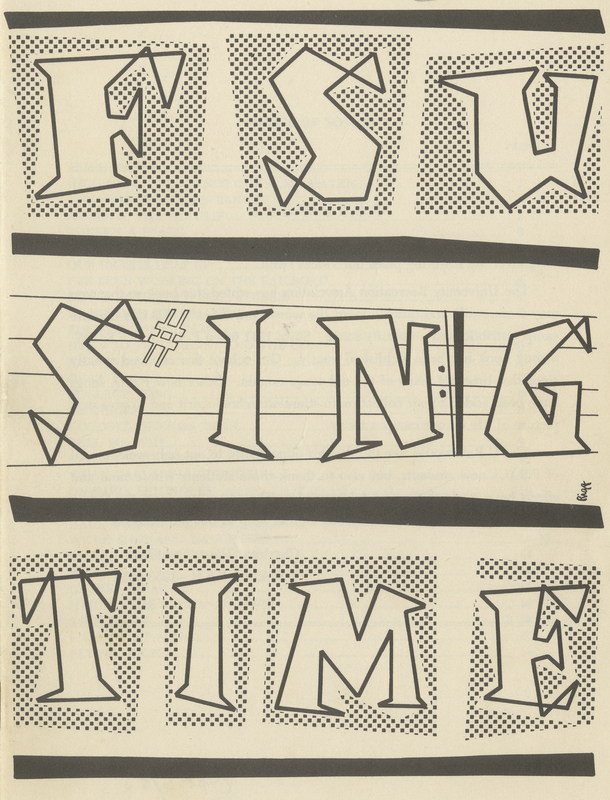 The FSCW Music Club edited the book with “the hope that this material may help toward a real renaissance of information college singing on campus.” This is the first collection of Florida State songs. That’s where you will find us. ‘Cause we don’t want to kill ’em quite. We’re out to beat ’em. So holler for the Red and White. Because they fear the Odd team so. The Florida Flambeau made appeals for the University to adopt an alma mater. After FSCW became co-educational in 1947, the school needed some new songs, specifically an alma mater. 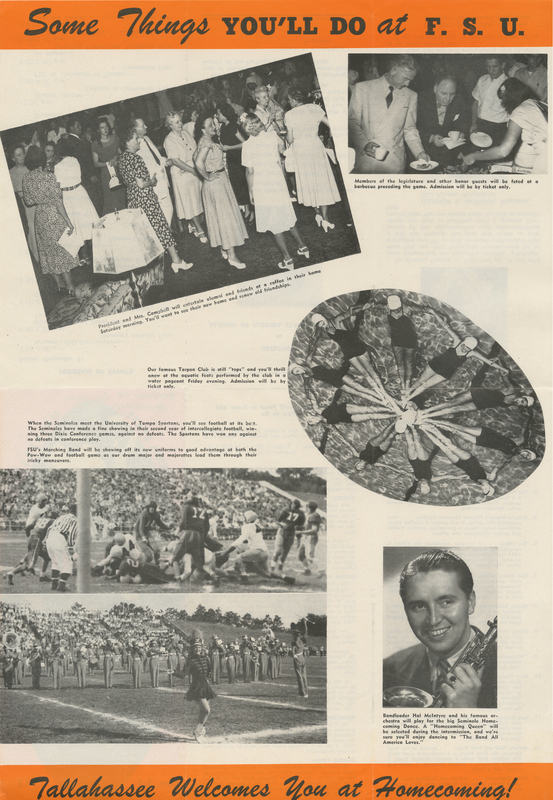 On May 16th, 1947, The Florida Flambeau announced a contest to select a new alma mater, and on November 21st, it was announced that Johnny Lawrence had won with his song “High O’er the Towering Pines.” While the song had been selected and performed at convocation and homecoming, the university dragged its heels to adopt the song. 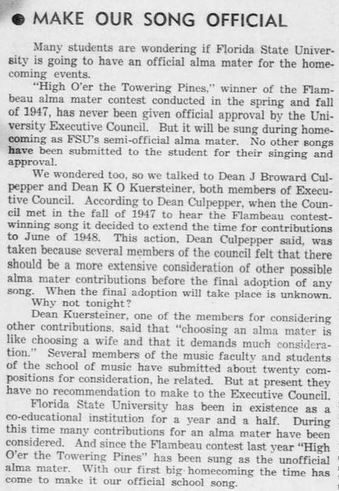 Flambeau writers appealed to the administration to make a decision, but were rebuffed by Dean of Music, Karl O. Kuersteiner: “[Choosing] an alma mater is like choosing a wife and that it demands much consideration.” Finally in 1949, two full years after the original alma mater contest announcement, the university officially announced “High O’er the Towering Pines” as the alma mater. Since then, there have been several other songs that have developed and shaped the identity of FSU: The Fight Song, written by Doug Alley and Dr. Thomas Wright, and the Warchant, a tradition that has one of FSU’s most disputed origin stories. Campus songs are still written today, in musical styles that are popular with modern students. A few years ago, FSU premiered “I’m in the Doak,” a parody of the Saturday Night Live sketch “I’m on a Boat” featuring famous former-Tallahassee denizen, T-Pain. More recently, FSU student Daniel Stamphil a.k.a. Blak Iron, released a remake of the Drake track “Know Yourself,” titled “Nole Yourself.” While these tracks herald a new era of campus songs, they will always echo FSU. 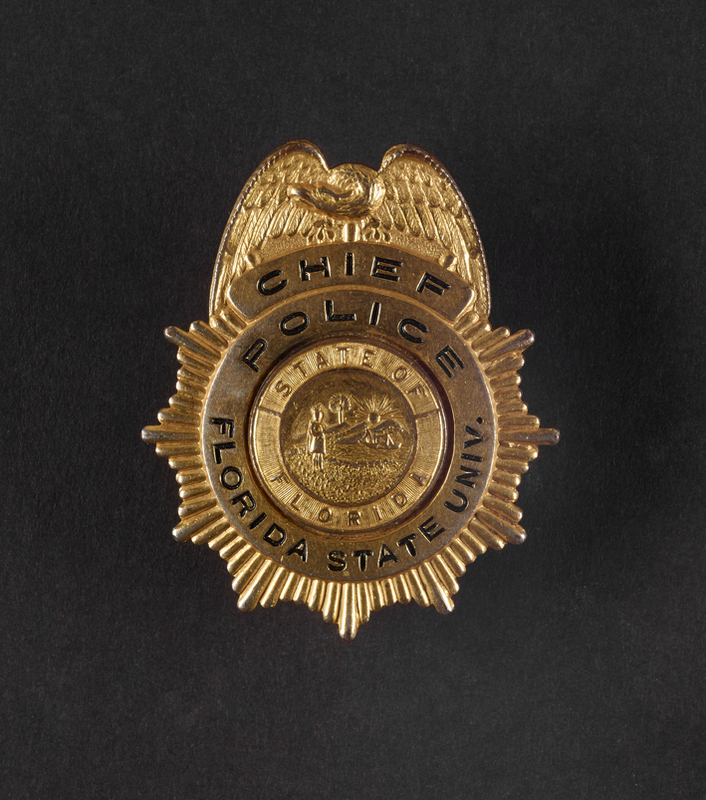 Lee Causseaux’s FSU Chief of Police badge. Badge courtesy of Patsy Yawn. 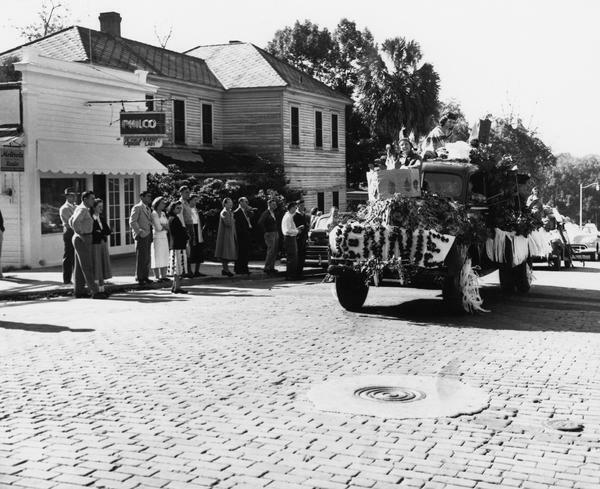 Born in 1900 in Woodville, FL, Lee Causseaux was the descendant of a long line of Leon County residents and spent his whole life serving the greater Tallahassee community. Considering FSCW and FSU his second home, “Mr. 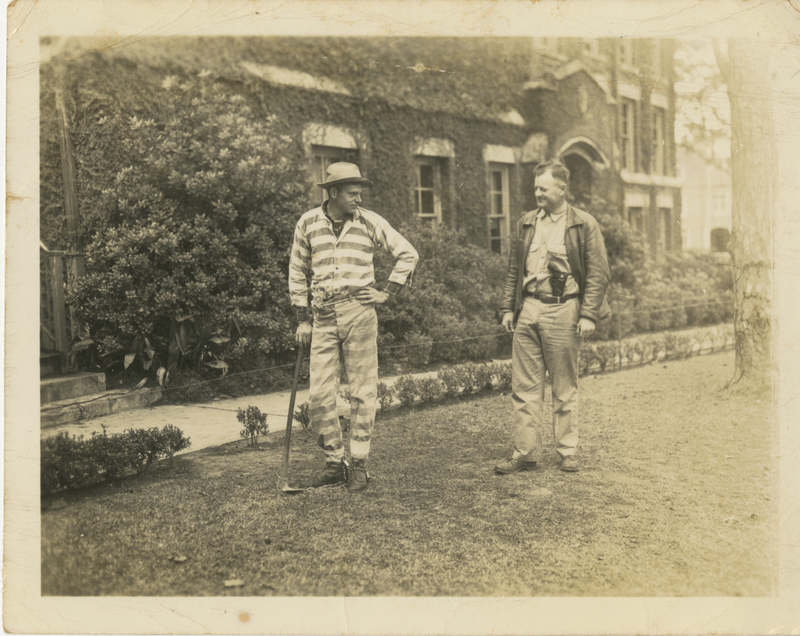 Lee” (as most people called him) occupied many positions on campus, ranging from laundry operations, Superintendent of Landscaping, and his eventual promotion to Chief of FSCW Police in 1945. His influence was felt outside of campus, too – he was often called on by the Leon County Sheriff’s Office and Culley’s Funeral Home for assistance. Before taking his position as FSCW Chief of Police, Causseaux protected students from a pervasive threat: the sun. As the Superintendent of Landscaping, one of his major projects was transplanting live oak trees from the campus arboretum to various locations around campus and Tallahassee. Causseaux’s love of landscaping never faded after leaving the position, evident from the friendship he had with accomplished horticulturist and FSU’s first First Lady, Mrs. Edna Campbell. He helped her landscape the President’s home after renovations, and she would often share plants with him for his new home. Lee Causseaux on Campus. Photo courtesy of Patsy Yawn. Causseaux’s law enforcement career started in 1932, when he was sworn in as a Leon County Deputy Sheriff and FSCW’s first day officer. In a 1956 Florida Flambeau article about the necessity of campus police, Causseaux remarked that when he started at the university in the early 1930s, there was only “one man, whose duties were chiefly those of a night watchman.” Throughout the 1930s, the FSCW police force grew to include 3 more officers, and by 1939, police uniforms had been issued. 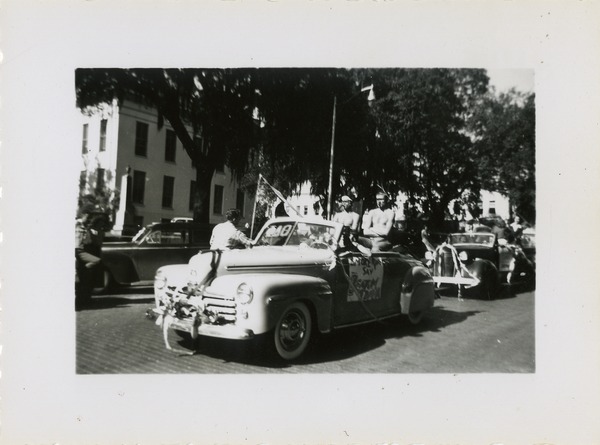 The department continued to grow during the 1940s, as the transition from FSCW to FSU saw an increased need for police. By the time of Causseaux’s death in 1959, the FSU Police Department employed nearly 20 officers. Lee Causseaux served as Chief of Police from 1945-1959. 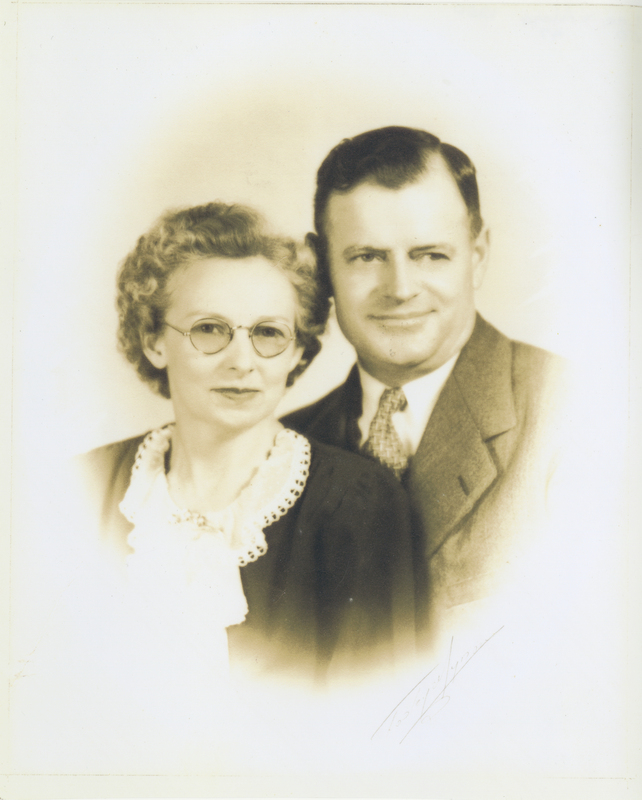 Lee Causseaux and his Wife, Alma. Photo courtesy of Patsy Yawn. 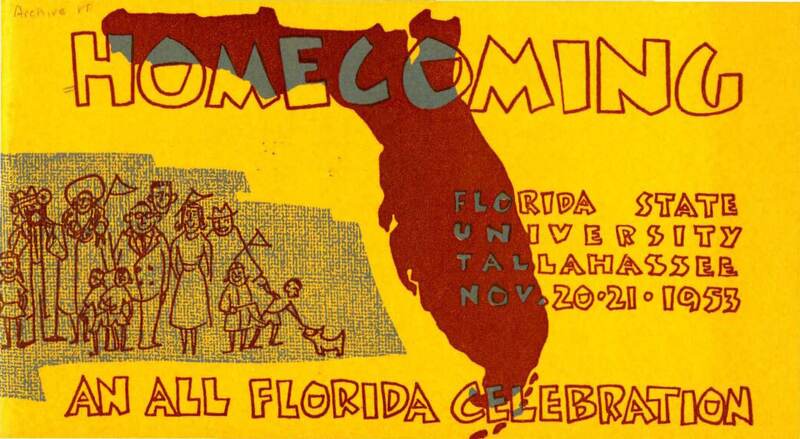 It’s Homecoming Week at FSU and there have been many exciting events happening around campus for students and alumni. 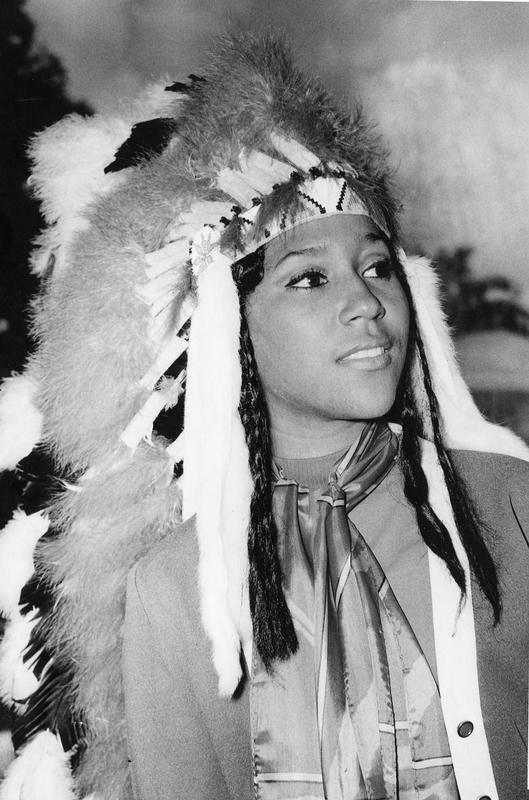 Homecoming is always a festive time of year at FSU, with events like Pow Wow, Warchant, the Homecoming parade, and the Homecoming football game to keep folks busy all week. 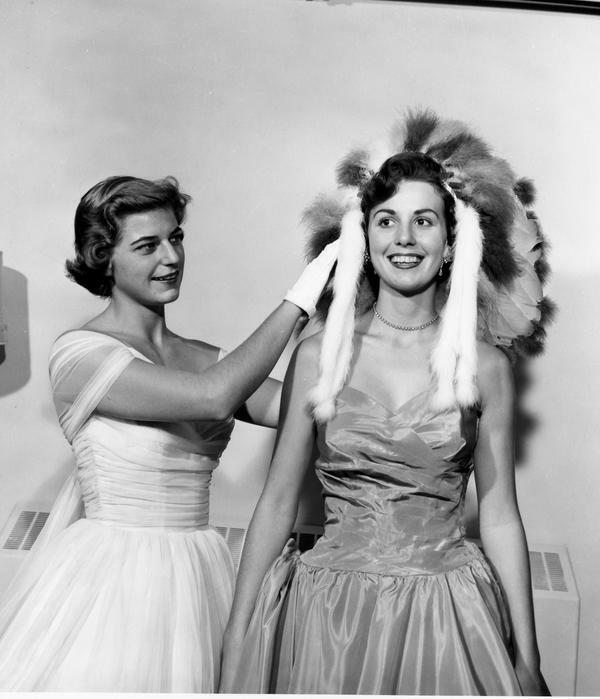 Please enjoy some photographs and ephemera from past Homecoming activities.